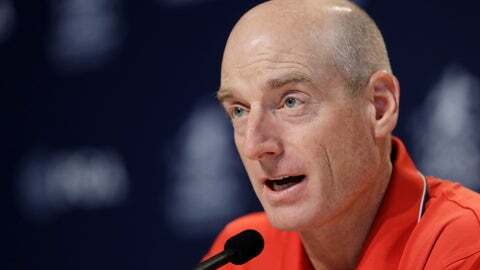 Furyk has been around long enough to understand the additional pressure of the PGA Championship in a Ryder Cup year. It is effectively two tournaments in one — the final major of the year and one last chance to avoid having to audition as a captain’s pick. Furyk had to rely on a pick in 2012, and he wasn’t so fortunate in 2016, when he finished 15th in the points and went to Hazeltine as a vice captain. That’s why he sent a text to Schauffele, the PGA Tour rookie of the year last season who contended deep into the British Open on Sunday until a bogey on the 17th hole left him two shots behind. He moved to No. 11, and with one-and-a-half the value of points for everyone but the winner at Bellerive, this is a big chance. Phil Mickelson is at No. 10, and there is pride at stake. Mickelson has never had to rely on being a captain’s pick, dating to his first team he made in 1995. “I just didn’t think that would be fair to the guys,” he said. Furyk was in that spot two years ago — under consideration for a pick who was involved as a vice captain in deciding. He would not commit to saying whether Woods has done enough because there’s still one more tournament.